Cyrus 8 DAC Mk2 with Cyrus Stream X Signature network music streamer and Chord Company Digital Cable (worth £100). Available with our 0% Finance. The all new Cyrus 8 DAC Mk2 ( or 82 DAC ). The Cyrus 8 DAC incorporates a high power integrated amplifier and advanced digital to analogue converter to provide a great sounding, versatile hi-fi amplifier. The latest Cyrus integrated amplifiers are all based around a high quality, scalable design, you can order with a number of exciting options to create exactly the system for your needs. The Cyrus 8 DAC delivers an impressive 70 Watts per channel and includes six analogue inputs that you can individually name from a list of options in the setup wizard. Also included is a great headphone facility and twin speaker output for bi-wiring. One of the outstanding features of this amplifier is that it is factory upgradeable allowing owners to retrospectively add the many other features found in the amps siblings. 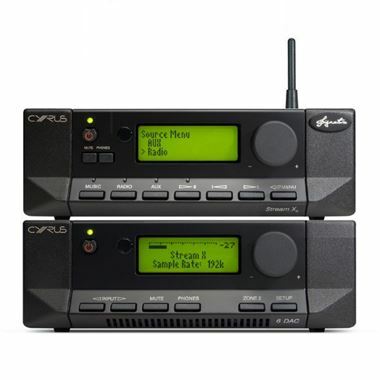 Cyrus 8 DAC is the perfect partner for the CD i, CD t or Stream X Signature.